Each transaction is a separate transaction. There are no automatic renewals or extensions. Once a loan is repaid you are automatically qualified to borrow again at your leisure. There is no credit check and no credit reporting, therefore, Discount Cash Loans will have zero impact on your credit score. Non-repayment may result in civil-litigation. The APR for a 14 day Payday Loan varies from 460% to 522% depending on your state regulations, but is clearly disclosed prior to entering into any agreement. Failure to make timely payments could result in a $30 NSF fee in some states. No other fees apply. Loans do not automatically renew and each loan must be paid in full before another loan will be approved. We do not report to any of the major Credit Bureaus. Consumer Notice: A single payday advance is typically for two to four weeks. However, borrowers often use these loans over a period of months which can be expensive. Payday advances are not recommended as long term financial solutions. DiscountCashLoans.net is regulated and licensed by each individual state in which it operates. A complete list of fees can be found on the "Our Rates" page. 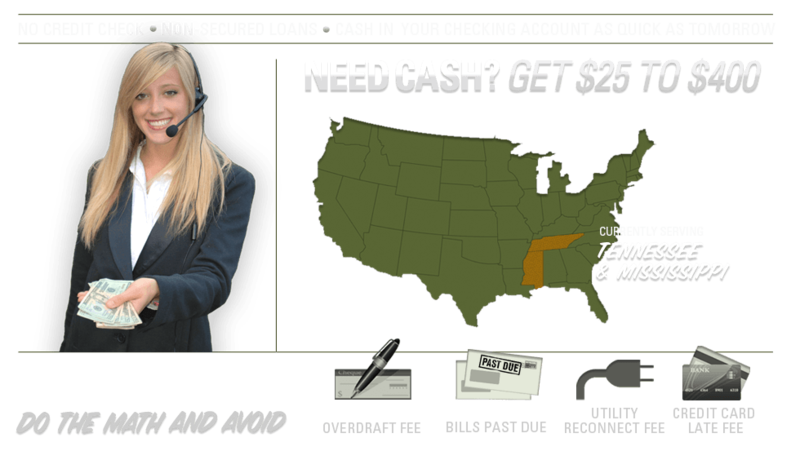 Discount Cash Loans provides Cash Advance and Payday Loan services for the following states and cities.